Glasshouse, a modular textile and wallcoverings range inspired by the relashionship between garden greenhouses and urban architecture. Glasgow based designers and founders of Bespoke Atelier, Yvonne Elliott-Kellighan and Marion Parola, launch their Modular Wallcovering System which will enable anyone to create their own bespoke interior. 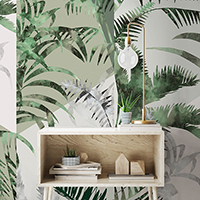 The design of the wallpaper collection ‘Glasshouse’ is inspired by the relationship between garden greenhouses and urban architecture. 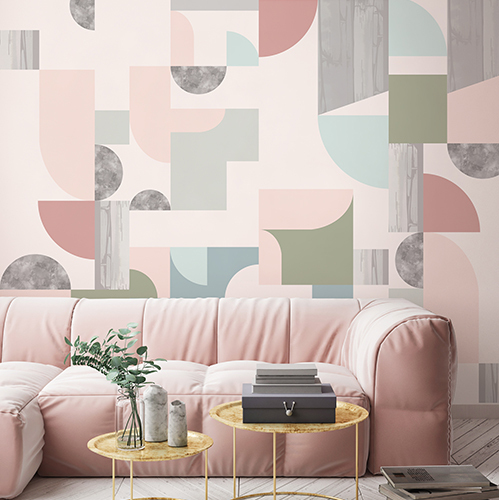 Glasshouse is the first collection using their Modular Wallcovering System made up of seven interchangeable designs based on hand-drawn geometric shapes and botanical elements inspired by patterns and textures of the surrounding environment. 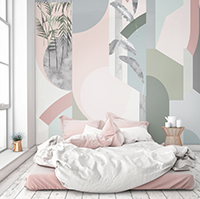 The designs ‘Stained Glass’, ‘Jungle’, ‘Foundation’, ‘Balance’, ‘Rise’, ‘Reflections’ and ‘Half Moon’ are available in two elegant colourways: ‘Dawn’ and ‘Dusk’. The variety of designs and colours available enable the creation of distinct atmospheres for every project or room. The wallpaper is sold in nine-metre rolls each containing three lengths of multi-directional patterns, which can be used together or separately, horizontally or vertically, to create exactly the effect required by each project, providing a unique result every time. Bespoke Atelier has created a swatchbook with modular pages to show how the different patterns and colours can be combined. The book can reveal, at a glance, how the different lengths work together or separately to create striking schemes for the wall. The possibilities are endless with the Bespoke Atelier Modular Wallcovering System: any combination of different designs and colours can be used alongside each other. Or, alternatively a single roll can be applied to enhance any space with a punctuation of flexibility and freedom. 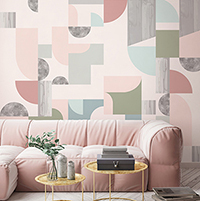 Bespoke Atelier is a surface design studio creating one-off screen-printed and digital patterns for interiors, architecture and the public realm. Since forming in 2011 Bespoke Atelier has created unique designs for hundreds of clients, including Deutsche Bank, Page \ Park Architects, The NHS, Scottish Canals and Meantime Brewery. 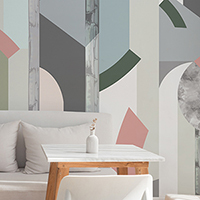 Before the launch of the Glasshouse wallpaper collection a bespoke interior from design duo Yvonne Elliott-Kellighan and Marion Parola would need to have been commissioned and tailor-made. 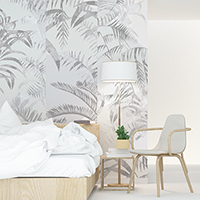 Their new and highly innovative wallpaper range now opens up the opportunity to use their distinctive designs in any interior, bringing a unique twist and unexpected outcomes to an interior space. Each roll length: 9m — 3 x 3m sections in one of seven pattern designs. Roll width: 52cm Roll coverage: 4.68m2 Available in three weights: Smooth, Vinyl, and Watercolour. Bespoke Atelier’s client list includes public and private sector organisations — architects and education services, private developers and heritage properties, restaurants and local authorities. 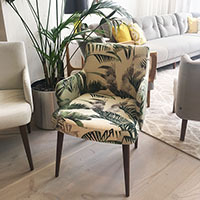 The design studio has established a reputation for designing bespoke patterns for a variety of applications from architectural installations and furnishings, vinyl manifestations and wallcoverings, bespoke acoustic panels and hand painted murals. Clients include: Deutsche Bank, Page \ Park Architects, The NHS, Scottish Canals and Meantime Brewery. Bespoke Atelier founders, Marion Parola and Yvonne Elliott-Kellighan, first met in 2005 as students of the Textile Design BA at The Glasgow School of Art. Each graduated with Honours before taking up the Master of Design in Fashion and Textiles the following year. Yvonne and Marion spent their graduate studies perfecting the practices they continue to use today as Bespoke Atelier. The first major turning point for Bespoke Atelier came whilst Yvonne and Marion were still completing their studies at the Glasgow School of Art: in 2010, they won the Deustche Bank Award, which provided the financial input the pair needed to get Bespoke Atelier up and running. After outfitting their studio with comprehensive screen-printing facilities, the duo quickly got to work on their mission to create custom-designed textiles, quickly expanding their practice to include printing on a variety of surfaces. Bespoke Atelier’s mission is to bridge the gap between architects, interior designers and artists by creating bespoke artwork and patterned design solutions that are embedded in the building or space. By using innovative design approaches and fabrication methods they create integrated interventions. They work closely with the client, members of the design team and end users engaging with them throughout the design process to provide an artistic approach that is rooted in its context. 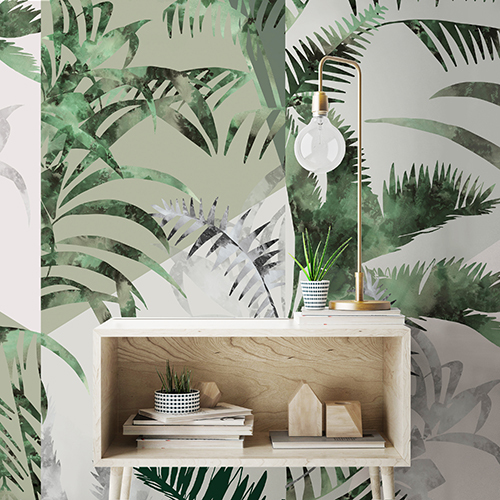 The design of the wallpaper collection ‘Glasshouse’ is inspired by the relationship between garden greenhouses and urban architecture. 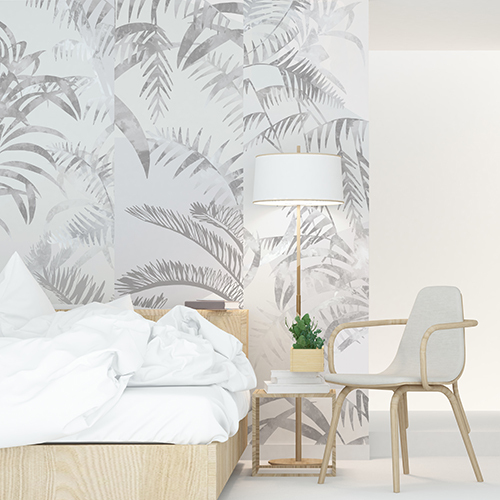 Glasshouse is the first collection using their Modular Wallcovering System made up of seven interchangeable designs based on hand-drawn geometric shapes and botanical elements inspired by patterns and textures of the surrounding environment. 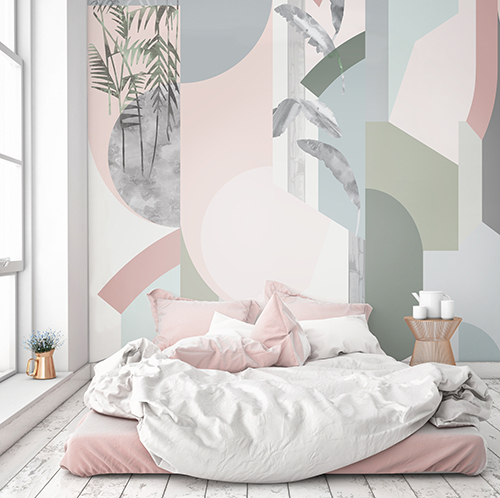 The designs ‘Stained Glass’, ‘Jungle’, ‘Foundation’, ‘Balance’, ‘Rise’, ‘Reflections’ and ‘Half Moon’ are available in two elegant colourways: ‘Dawn’ and ‘Dusk’. The variety of designs and colours available enable the creation of distinct atmospheres for every project or room. The wallpapers are available in three different weights, smooth, vinyl and watercolour suitable for contract and domestic interiors. The wallpaper is sold in nine-metre rolls each containing three lengths of multi-directional patterns, which can be used together or separately, horizontally or vertically, to create exactly the effect required by each project, providing a unique result every time. Bespoke Atelier has created a swatchbook with modular pages to show how the different patterns and colours can be combined. The book can reveal, at a glance, how the different lengths work together or separately to create striking schemes for the wall. The possibilities are endless with the Bespoke Atelier Modular Wallcovering System: any combination of different designs and colours can be used alongside each other. Or, alternatively a single roll can be applied to enhance any space with a punctuation of flexibility and freedom. Glasshouse Fabrics are inspired by the relationship between garden greenhouses and urban architecture and are printed on a cotton velvet for luxurious cushions, a Scottish woven fabric for upholstery and a wool delaine for wallhangings.